Looking for the best groundhog baits to use in 2019? Then you've come to the right place! Out of the groundhog baits we reviewed, our personal favorite is the Pro-Pest Groundhog Lure for a few distinct reasons: it's affordable, it's not going to hurt you or your pets, and it gets the job done, period. Pro-Pest Groundhog Lure comes as a paste that can be spread around all kinds of traps, including live cages. It is not waterproof but can withstand most environmental conditions due to its synthetic consistency. Why we love it: this bait mimics peanut butter without containing any allergens! If you didn't already know, peanut butter is one of most effective household baits for rodents and nuisance animals. Many people, however, are forced to abandon this tactic due to their allergies. Pro-Pest Groundhog Lure sidesteps this problem by producing a bait that contain zero allergens and safe for those with peanut allergies. If you're looking for something a bit more sweet-smelling, we can also recommend our second choice: Blackie's Blend Berry Sweet, which is a non-toxic, fruity alternative bait. Please remember that groundhog baits are not 100% effective and some woodchucks will not be attracted to the materials. If you're interested in learning more about groundhog baits or want to read more about the other products we considered, see below! Why Use a Bait Over Natural Foods? Groundhog bait is a product designed to specifically attract groundhogs to a location. These products are usually are used in conjunction with traps in order to move the animals from one location to another. Most are pastes which can be smeared in a designated area and won't move around with the wind. Groundhog bait is pretty effective and inexpensive. Below are some of the most popular options in the United States. Short on time? Take a look below for the top 3 in our list. Otherwise, check out our buying guide! Groundhog bait is exactly what it sounds like—a specially-designed, edible substance created to attract and trap woodchucks. Many types of baits can be made at home, since groundhogs like to eat fresh fruits and vegetables. If you don't want a special bait (although they are more effective), you can cut fruit and leave pieces near a trap. Read Also: What's the best trap to catch groundhogs? Check out the video below to see what the Humane Society of the United States uses when they're looking to bait a groundhog in a short span of time. Groundhogs are vegetarians, though they will eat insects in times of absolute necessity. Since they enjoy plants so much, most baits are derived from berries, greens, and other sweet juices. Sometimes companies will include human foods like peanut butter, since they have strong scents and include a lot of sugar. Some companies develop baits designed especially for groundhogs, while others are more general. It goes without saying that a bait specially made for woodchucks tends to be more effective than a general bait, since the ingredients closely match the ideal groundhog diet. When you're shopping around for a bait, make sure to check the label or product description to verify whether the bait is catered especially to woodchucks, or suited to trap nuisance animals in general. Does Groundhog Bait Come With a Trap? Baits and traps go hand-in-hand: when a person thinks of trapping a live animal, chances are that the thought of which type of bait to use isn't far behind. This, naturally, begs the question: are these two items sold together? Almost all baits are sold separately from traps since the baits themselves are inexpensive while traps can be costly. However, it should be noted that baits work with almost every style of traps, including popular wire-mesh cages. If woodchucks basically inhale all the fresh fruits and dandelion weeds they can get, it's common sense to put these items in a trap, right? Not necessarily. As it turns out, there are actually a few key reasons why it's a better buy to go for a formulated bait when you're trying to trap a woodchuck. Are There Any Health Risks of Bait? Baits have little to no health risks. Humans still should not eat any of the material, but it shouldn't be toxic for people, groundhogs, or pets who might be curious. If the label of a bait specifically says it is poisonous, do not place it anywhere that a pet like a cat or dog will eat it. Also, keep all baits away from children at all times. What Makes a Bait Better Than Fruit? Here's the sad truth: while a groundhog will absolutely be much more attracted to a gorgeous array of strawberries nestled inside a trap, the likelihood that this animal will sniff them out in time is minimal. Here's a scenario that's far more likely to happen: you set your trap full of strawberries, and you wait. And you wait. And you wait. Eventually, the strawberries begin to rot, staining your cage. You've wasted perfectly good fruit (you could've enjoyed those yourself! ), and you've still got a groundhog on the loose. Nobody wins. Bait, on the other hand, generally doesn't expire in the elements. Because it's synthesized and made from artificial materials, you can let it sit for as long as it takes for your groundhog to emerge from its burrow and fall victim to the trap. In general, a professional bait will get the job done. More often than not, these are lab-tested, consumer-approved products that won't blow away in the breeze or dry out in the sun. However, if you've got a garden or lawn with lots of delicious plants like carrots and peas, then unfortunately, the groundhog might not be tempted by a bait. If this is the case, use some of the food that the animal keeps decimating. 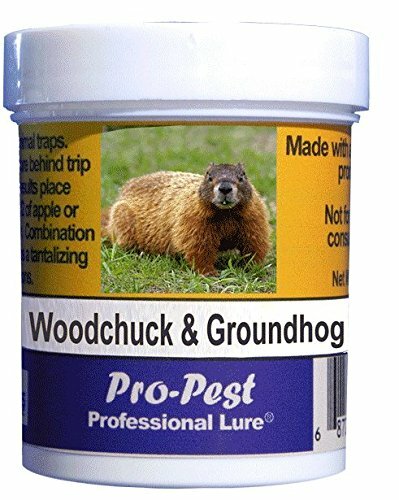 The Pro-Pest Groundhog Lure is an easy-to-use paste which can be spread in or around traps. It doesn't hurt woodchucks or other animals which might taste the bait. Unlike a lot of other products, the Pro-Pest bait does not include any allergens or foods like peanuts. It is safe to use around day cares, hospitals, and food processing plants. As an added bonus: this bait contains absolutely no pesticides. 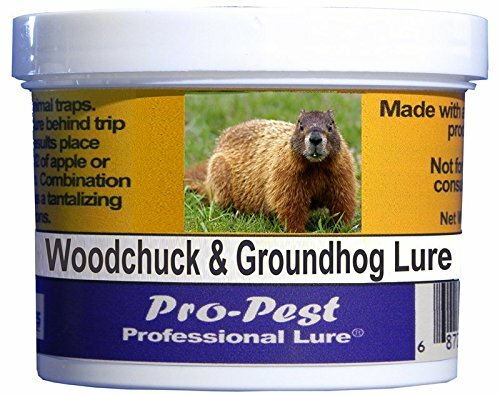 Here's one of our favorite aspects: Pro-Pest Groundhog Lure is relatively inexpensive compared to other options, and comes in a large 8 ounce container. It can be used any time of the year and in various different climates, but is not waterproof. We recommend this product to people who know they will need to catch more than one groundhog in their backyard, and would like something that doesn't hurt the animals. Blackie's Blend Berry Sweet is a fruity-smelling woodchuck bait that also works to lure in raccoons, foxes, and other small mammals. It can work year-round but might become icy in the winter. This groundhog bait can be used in live traps and is non-toxic. It's a smearable paste made from fresh ingredients which match the diet of woodchucks and is pretty inexpensive. A single container has multiple uses and is lucrative for trapping a variety of nuisance animals. 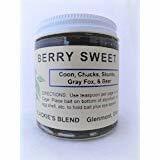 Blackie's Blend Berry Sweet is ideal for those who live in rural areas or on farms and have several different species of animals to trap—be it raccoons, opossums, feral cats, or chipmunks. Because of this product's paste consistency, a draft won't blow it out of the trap or move it in any way. It'll stay right where you put it...that is, until your groundhog gets to it! We recommend this product to people who might need to catch multiple types of animals or who want something that smells pleasant. Believe it or not, vanilla extract is an optimal bait for groundhogs because of its scent: the sweet-smelling aroma works just as well as a fruit concentrate. Another benefit of vanilla extract: it's a breeze to apply to all kinds of traps, because its liquid form will easily coat any surface. 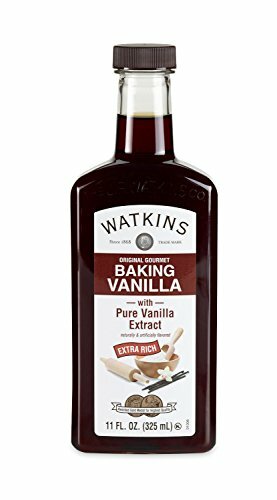 Watkins Vanilla Extract can be found all around the United States, and comes in bottles of 1-11 oz. It's non-toxic and should not cause any harm to woodchucks, pets, or children who might be curious about its delicious smell. The extract is relatively inexpensive and can be stored easily. We recommend it to people who want a change form regular groundhog baits and would like something simple and natural to use. 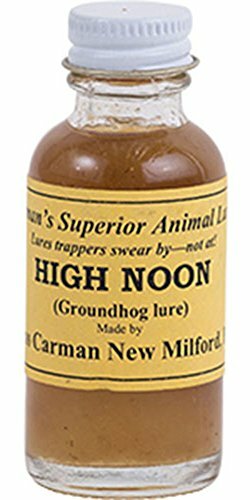 The High Noon Groundhog Lure is a specially-made bait which can be applied to all types of traps. It is non-toxic for groundhogs and has been developed to smell like their favorite foods, enticing them out of their burrows and into your traps! A 6 ounce container is inexpensive compared to its competitors, and this size should last you several uses. This lure, effectively, pays for itself: by purchasing a bottle at this size, you'll be able to use it season after season. Needless to say, this bait possesses a highly strong smell, but this should only attract woodchucks. We recommend this product to people who specifically want to catch groundhogs and are looking to place something affordable in their groundhog traps. People will have different needs when it comes to groundhogs. Some want to eliminate them, but others would like to trap them and release them later. The trapping method requires a tasty bait, though.